Each year DIAC has grown and been a converging point for participants, exhibitors and partners from across the region and internationally for EMERGENCY Services. This year, the Dubai Corporation for Ambulance Services will be conducting this event in partnership with INDEX Conferences & Exhibitions on topics that are of key importance to the sector. Discussions will be based around pre-hospital care, ambulance services, technological advancements and the initiatives undertaken by the corporation to fulfil the vision and under the guidance of H.H. Sheikh Mohammed Bin Rashid Al Maktoum, Vice-President, Prime Minister of United Arab Emirates, Ruler of Dubai. 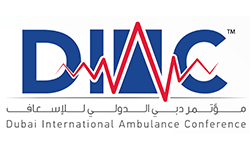 DIAC 2018 will focus on areas that are of prime importance to the Emergency Medicine Sector, the pre-hospital care using technology as an enabler to highlight improvements that are underway and the objectives to support the Expo 2020. I would like to cordially invite all EMS Personnel ,Paramedic, EMTs, decisions makers, safety and security personnel’s and representatives of pre-hospital care institutions to seize this learning opportunity and make the most of this three day international conference and exhibition.